The Last Ditch Kit has been developed and designed by 4TAC5.COM who are subject matter experts for governmental, diplomatic, law enforcement, intelligence and special operations personnel that are prone to abduction, kidnap, restraint and detention, during conditions of armed conflict, civil unrest or operations other than war. The first part is the Escape Kit for dealing with unlawful restraints, transportation and imprisonment. These items should be carried and concealed on the person, hard to find during an initial search of outer clothing whilst allowing for access when restrained to the front or rear. The second part is the Evasion Kit that provides components to obtain a general direction, make a signal day or night (smoke/fire) and an emergency light source. These items are carried and protected inside a waterproof container. There is sufficient space in the container that would allow for further items to be added. The Uber Gulag Shim is precision engineered to work with a wider selection of handcuffs that would otherwise resist or fail to shim with other commercially available shims. These include American UZI, British TCH, Czech ALFAproj, Polish KEL-MET, Russian BRS-2, Russian CROT and Spanish ALYCON. When using the Uber Gulag Shim the silky smooth operation almost makes shimming effortless! In additional to its unique design features the Uber Gulag Shim is 301 Full Hard Stainless Steel that differs from other forms of 301 in that it has been hard cold rolled to its full hard condition. This increases its fatigue life. In its full hard condition, type 301 stainless steel has a tensile strength of 185,000 PSI minimum, and a minimum yield strength of 140,000 PSI. So unlike spring steel the Uber Shim will not easily snap when bent so it is possible to reshape and straighten. Tip: Do not force the shim as you will bend it! Always start shimming where the ratchet arm enters, there should be a small gap, insert the tip of the shim and at the same time slightly push in the ratchet arm to assist (push assist). Only do this if the shim is moving between the ratchet and pawls (teeth) otherwise you risk over-tightening the handcuffs. In the event that shimming does not work it is possible that the handcuffs are either double-locked or have security features to prevent shimming. Some handcuffs feature anti/counter shim features in their design or they can be double locked (also known as transport lock); this can make shimming difficult so using a key is often the quickest and easiest method to remove handcuffs. A universal handcuff may work on some handcuffs but if there are anti/counter shim features present it is likely that a special key will also be required. Also known as the Delta Key the AHK3 is the latest generation of handcuff key designed to counter the security features found on high security handcuffs such as a key blocking blade, large key-way pin and deep set key-way. For some handcuffs it will work just like a key and on others you have to alter the depth and angle whilst feeling for working parts. Handcuffs only require slight pressure with a key to push down the pawl and disengage the ratchet to unlock. When under stress it is easy to apply excess torque when turning a key. The AHK3 is mild steel with a phosphate coating and unlike the polymer handcuff keys it will bend and not break. If excess torque is continually applied the key flags on the AHK3 will eventually break away so the remainder of the key can be easily removed. This maintains a clear key-way to allow for another key to be used. When polymer handcuff keys break they tend to block the key-way and they are difficult to remove. With training it is possible to make field expedient escape tools using some of the AHK3 features. When installed with the Advanced Handcuff Key the R Clip can improve manual dexterity. This is particularly useful when handcuffed to the rear and for advanced escape techniques such as the ‘reach around’ developed to deal with rigid and hinged handcuffs that are double-locked with keyway facing inwards. The R Clip can also be used as an actuator to double-lock / apply the transport lock on some handcuffs. This is a covert necklace designed for use as a friction saw to cut through non-metallic restraints when restrained to the front. Simply feed one end of the cord through the restraint, place the foot loops over the toe part of your shoes or if barefoot between the big toe and increase the tension of the cord so it positions itself on the lower part of the restraint to avoid friction injuries. Now move your feet in a slow pedal motion and gradually build up speed. The heat from the friction will burn through the restraint. The cutting knots are for heat resistant natural ropes that are impregnated with oil. This tool can also be used to unlock some Darby Handcuffs (male version with screw thread). The TEN also features the Micro Striker Bead Tungsten Carbide (MSB-TC) for breaking tempered glass windows (car side windows). Concealed inside the plastic breakaway connector the MSB-TC is hidden until you require it. To deploy you pull on the cord either side of the breakaway connector to disconnect. The MSB-TC is seated inside the female part. Simply pull the plastic female part down the cord and past the first cutting knot whilst holding onto the MSB-TC. Then wrap the cord around your hand and leave about 12 inches of cord hanging free with the MSB-TC on the end. Swing the MSB-TC towards the glass – very little force is required as the mineral hardness of the MSD (9.5 MOHS) is greater than glass (will punch a hole in a glass bottle!). You can use this to escape from a car or rescue persons from a car (the friction saw will cut seat-belts). The silicone retainers are fitted as standard and can be used to carry various tools such as the AHK3, UGS and mini chemical light sticks. 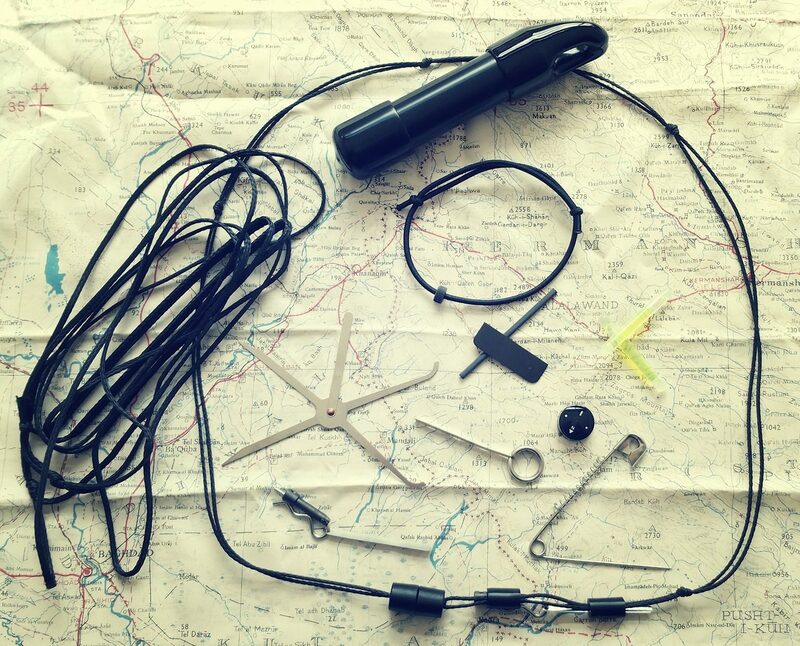 The necklace when fully loaded with escape tools is known as the Advanced Personal Escape kit (APEK). The friction saw is often overlooked when it comes to carrying and concealing a counter custody kit. Using force to break cable-ties and duct tape or using boot laces are almost common knowledge. It’s therefore wise to anticipate that the hostage taker will restrain you to the rear. The Advanced Friction Saw 600 is designed for easy concealment and carry to allow for rapid deployment and immediate use (front or rear) without preparation so it can be used during the transportation phase (car boot). With training there other methods that can be used to remove restraints both with and without tools. This is a wearable tool that facilitates emergency vehicle egress via side or rear windows in confined spaces. The material of the projectile is also used in armour-piercing ammunition and only a small amount is required to destroy tempered glass – just a single strike directed from the wrist strap is enough to break glass! The GTFO Wrist Strap features an End User Adjustment System for a custom fit. The SAD Tool is 301 Full Hard Stainless Steel that differs from other forms of 301 in that it has been hard cold rolled to its full hard condition. This increases its fatigue life. In its full hard condition,type 301 stainless steel has a tensile strength of 185,000 PSI minimum, and a minimum yield strength of 140,000 PSI. With the appropriate skills, knowledge and understanding the SAD Tool can be used to facilitate escape from unlawful restraints and captivity using non-destructive methods. These are premium quality British made rust proof safety pins manufactured from high tensile stainless steel spring wire. They will not bend or deform easily so can be used to perform some of the functions of the SAD Tool. A compression spring has been installed to allow for various carry and concealment options for the SAD Tool. For covert carry and concealment of the SAD-Tool and other FT-CCK3 components we recommend loading the items into the Go-Tube ‘Strap-on’. It can also be used for carrying cash (10 x $100 bank notes) and other valuable items such as micro SD cards, SIM cards, SERE Kit etc. The shock-cord waist strap is worn around the waist to allow for easy access to Go-Tube and contents when restrained to the front or rear. To install simply place the shock cord around your waist and tie a knot to secure (not too tight, not too loose). We recommend wearing the Go-Tube inside your underwear so it’s positioned at the front with the shock cord tucked a way. This is a tried and tested method of carry that conceals the items until they are required. To access the Go-Tube simply reach into your waistband, grab the shock cord and pull to extract the Go-Tube. The Go-Tube hanger cap is sealed with heat-shrink to prevent it from coming off as you pull on the shock cord to access the Go-Tube contents. Note: there is a clear plastic disc installed inside the round end cap to prevent the SAD-Tool from penetrating the end cap. The SERE Button Compass should be installed behinf the disc. To access the contents remove the round end cap by prising it off with your finger nails – remove iten required – replace end cap and tuck away! Vinyl End Caps for comfort when worn against the skin. The Micro FireSteel produces sparks of 3,000°C when struck with the back of the Ceramic Razor Blade. This Ceramic Razor Blade is also an extremely sharp and wear resistant cutting tool (chisel razor edge). Ceramic blades are as hard as diamonds. This makes them sharp as well and are much harder than anything steel has to offer. They stay sharp 10 times longer than steel blades and depending upon what you are cutting they will last up to 40 times as long. They are ideal for cutting into clothing seams to carry and conceal items. These 1.5 inch mini chemical light sticks will glow green for 4hrs. They are safe and do not produce heat, flames or sparks so they can be used safely in areas of combustible gasses or liquids. They are non-toxic; however repeated bending will causse the plastic to break. Skin or eye contact with the liquid may cause temporary discomfort but no lasting harm. Rinse the affected as soon as possible with clean water. They will keep for 2 years + if stored away from UV light (sunlight) as prolonged exposure will degrade the performance. To activate place across index and middle finger, use thumb to press down and bend plastic slightly then shake until glowing bright green. This creates an exothermic reaction. The chemicals inside the plastic tube are a mixture of the green dye and diphenyl oxalate. The chemical in the glass vial is hydrogen peroxide. Once activated you cannot turn it off – it will continue to glow for 4hrs. We recommend holding the light stick in the palm of your hand so you can direct the light where you want it whilst shielding it away from your eyes. ALL components with exception to the 14mm Button Compass (embossed JAPAN) will be sterile and free from manufacturing stamps, branding etc. The LDK will be supplied in a clear case. Update 13NOV2018: A new version of this kit will become available from 01DEC2018. It is assumed that the end user will have the appropriate training, skills and knowledge to use the components effectively. Some components have other uses that may not be immediately obvious and some methods of escape and evasion require no tools. The Progressive Restraint Escape System™ (PRE-System™) was developed in 2014 by a former British Police Officer and subject matter expert for governmental, diplomatic, law enforcement, intelligence and special operations personnel that are prone to abduction, kidnap, restraint and detention, during conditions of armed conflict, civil unrest or operations other than war. No other course, commercial, law enforcement, security or military provide this level of technical and tactical training for counter custody and restraint escape. There are now 50+ Certified Instructors worldwide that are authorised by 4TAC5.COM to teach the Progressive Restraint Escape System™. Copyright © 2017 LDK. All Rights Reserved.